It's not clearly visible in the photo, but it's actually a sturdy piece of an oilcloth tablecloth. So it's got that waxy surface and overall stiffness of an oilcloth even though it's completely matte. 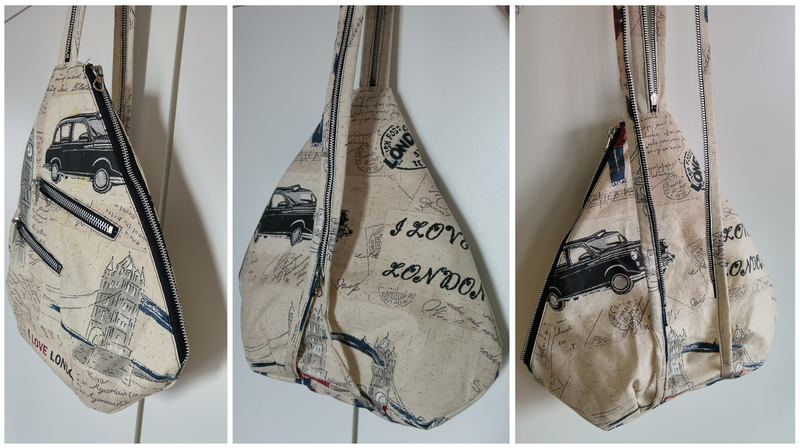 I thought it'd make a fine sling bag. Or a backpack. Or maybe both? At the same time. 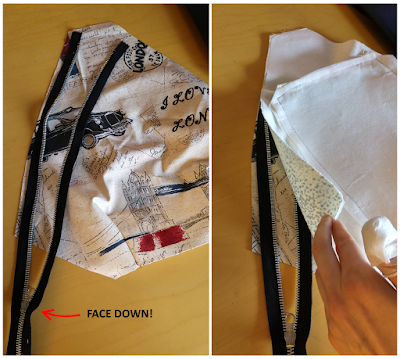 So then I drafted an idea for a nice summer-appropriate (=waterproof) bag. With these measurements, the finished bag is 36cm tall and 38cm wide at the widest part. If you want to make yours bigger or smaller, adjust the pattern. - About 0.5 meters of sturdy fabric for the outside of the bag. 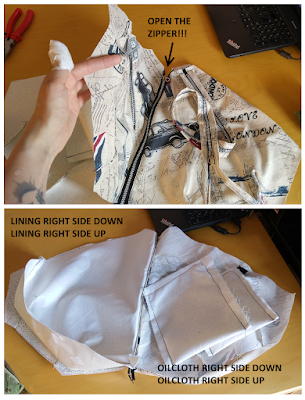 - About 0.5 meters of lining fabric of your choice (I just used scrap pieces left over from other projects). 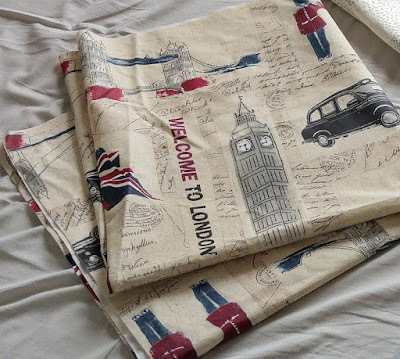 - Some iron-on interfacing if your fabric(s) aren't sturdy enough. 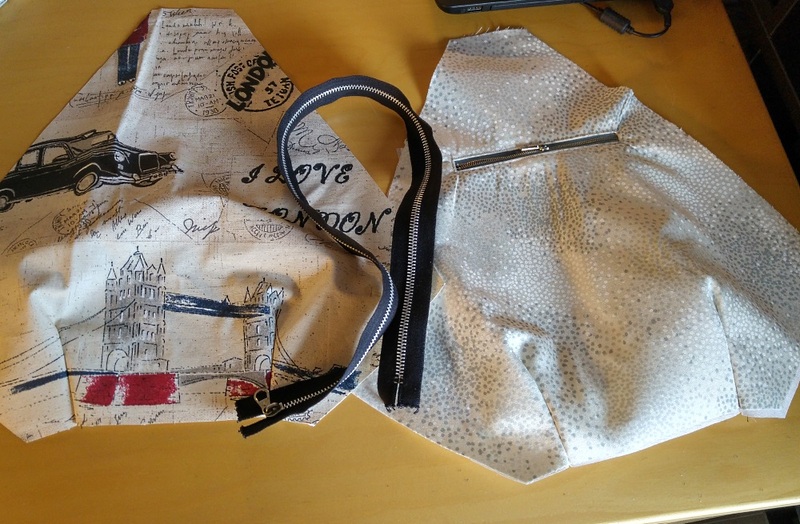 I used interfacing for the lining and pocket pieces. - A zipper that's at least 60cm long (mine was 65cm). 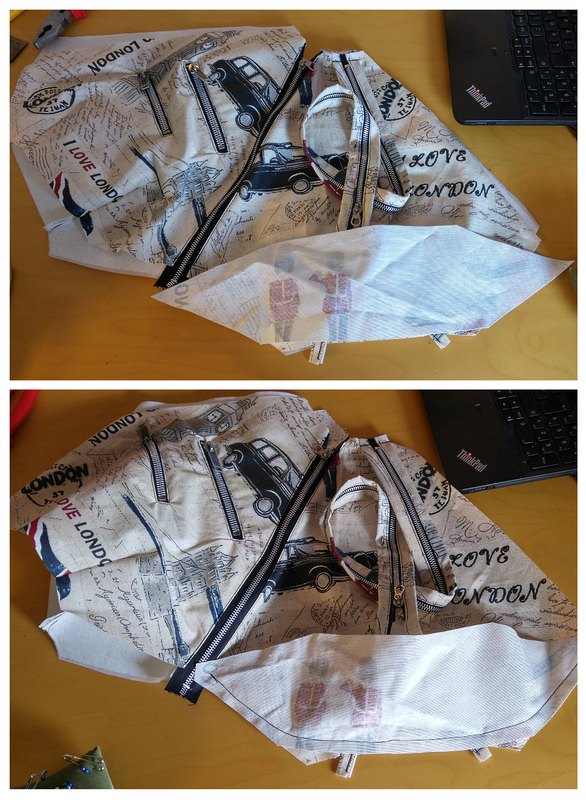 - A zipper that's about as long as the longer side of the backpack (in the picture 33cm). 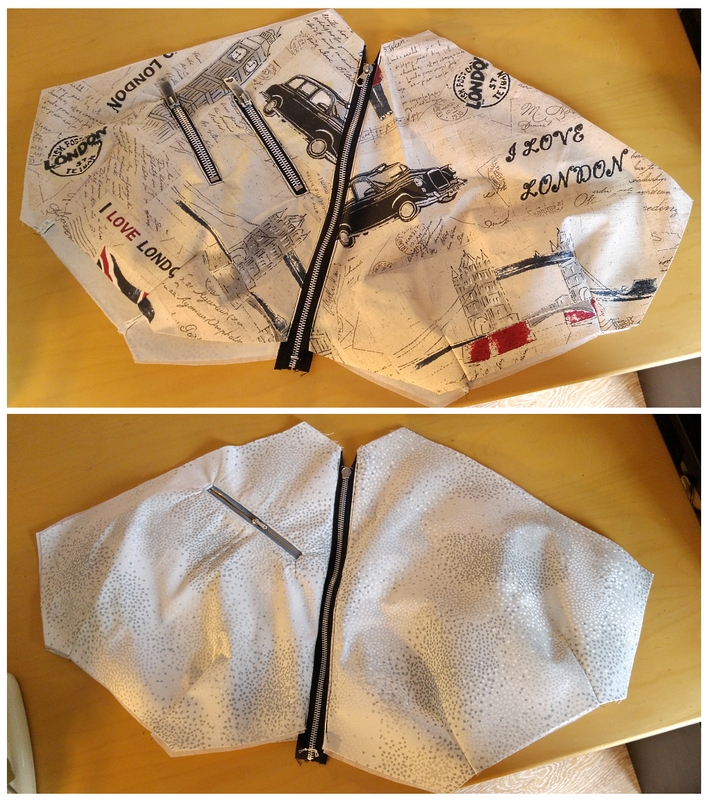 I simply cut a longer zipper to match the side. 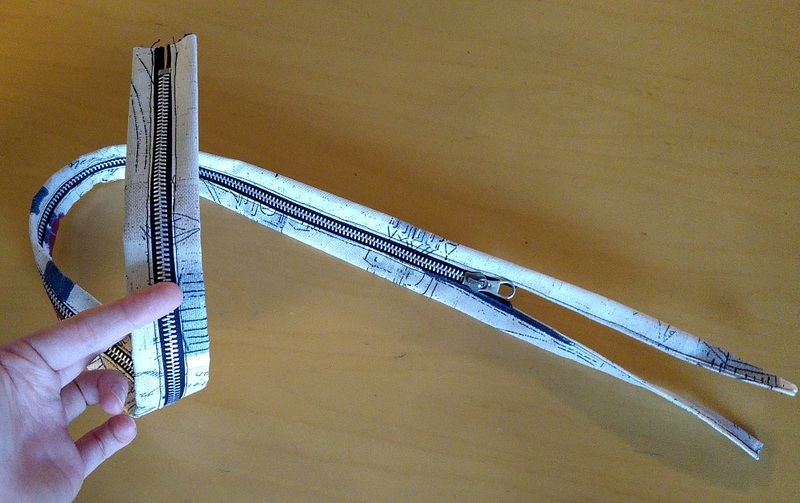 - Two or three shorter zippers, about 15cm long. The amount depends on how many pockets you want to make. I had two for the front and one for the inside of the bag. - Some paper, pen, scissors and a ruler (to draw the pattern). 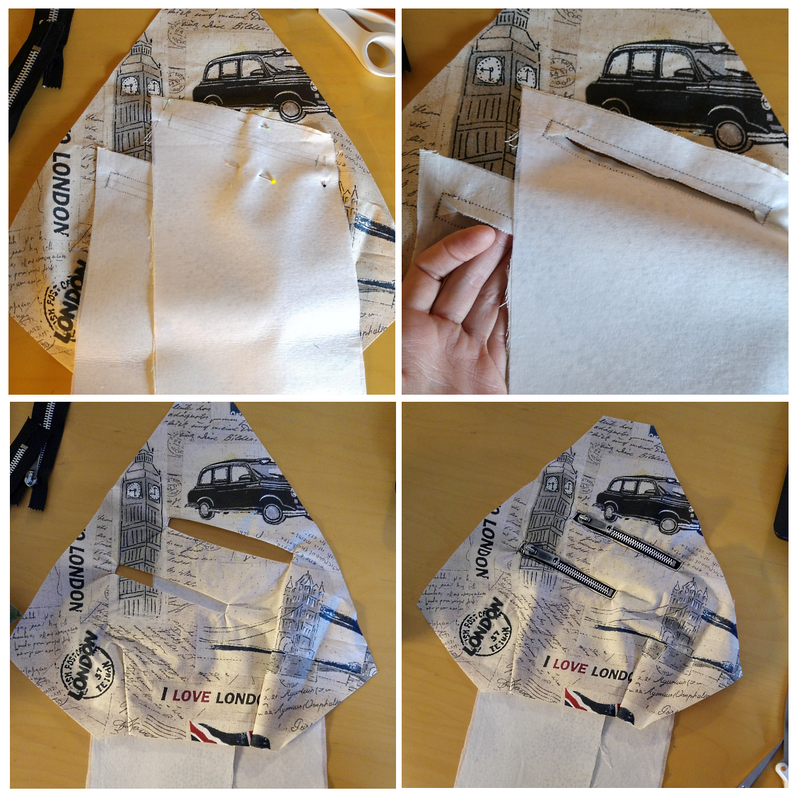 First I drew and cut out my pattern. It fit nicely on two standard A4 sheets taped together. I placed the pattern on fold on the oilcloth fabric and cut out two pieces. I also placed the bottom piece on fold and cut one. Next I cut two long, narrow pieces for the straps. The measurements were 85x5cm. So about 20cm longer than my zipper that's embedded in the strap. Then I used the pattern to cut out two lining pieces and one bottom piece. 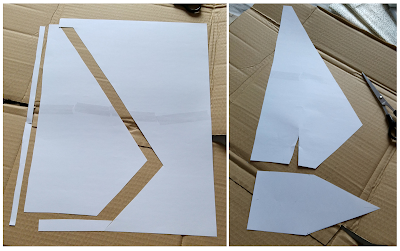 I also cut out three pocket pieces. 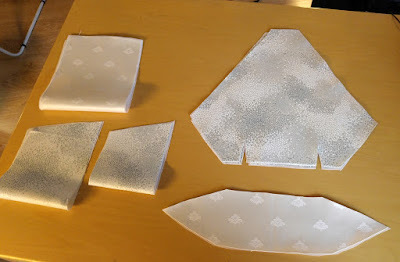 I put iron-on interfacing on all these pieces. 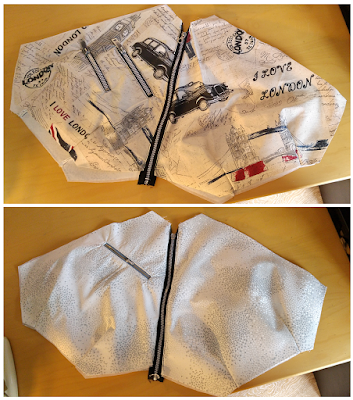 As for the pocket size, I simply placed my zippers on top of my front piece to see where I wanted them to be. 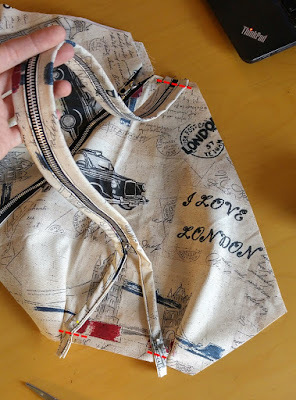 Then I measured the distance from that point to the bottom of the piece, subtracted approximately 2cm, and then doubled the number (because the pocket piece is folded in half to form the pocket bag). 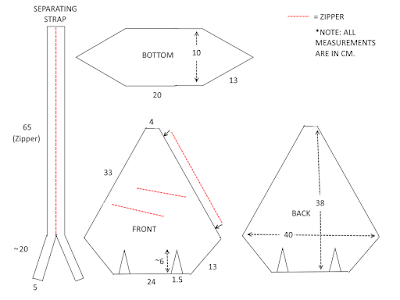 The pieces on the front have diagonal upper edges because the zippers are placed diagonally as well. 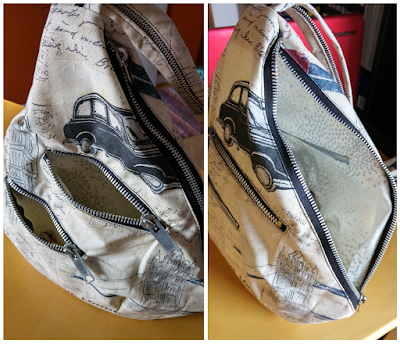 The bigger pocket piece above the two is for the pocket inside the bag. So then I had all the pieces and the sewing could begin. I started with the separating strap. 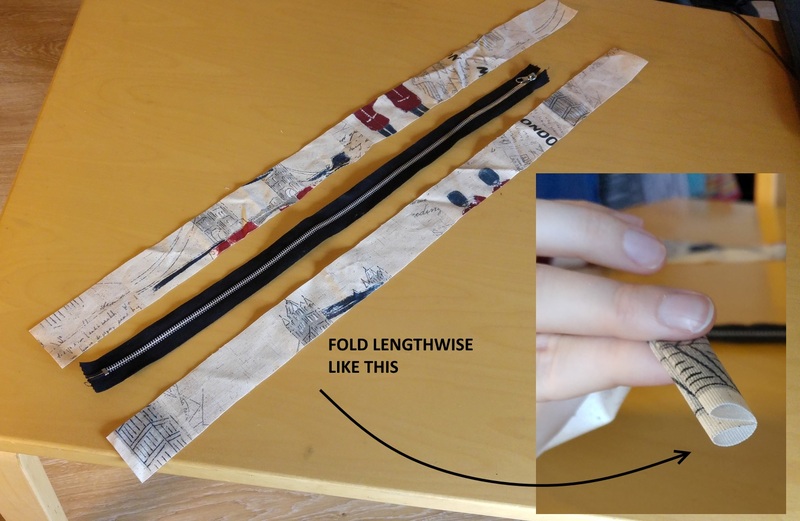 I folded the raw edges in lengthwise and then folded the whole thing in half again. 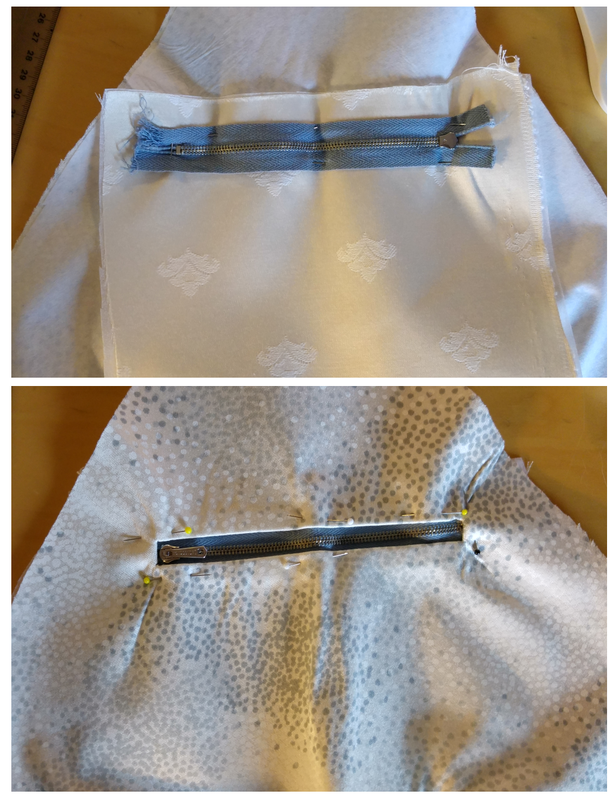 The oilcloth didn't like ironing (I tested on a scrap piece), but if you're using a fabric that can be ironed, definitely iron the folds in place, it makes this part a lot easier! 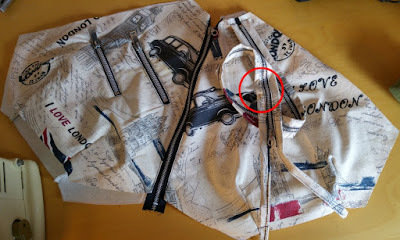 Starting from the end of the zipper, I sandwiched one side of the zipper in between the folded fabric. Once I got to the point where the zipper ends, I simply kept folding and pinning the strap alone. 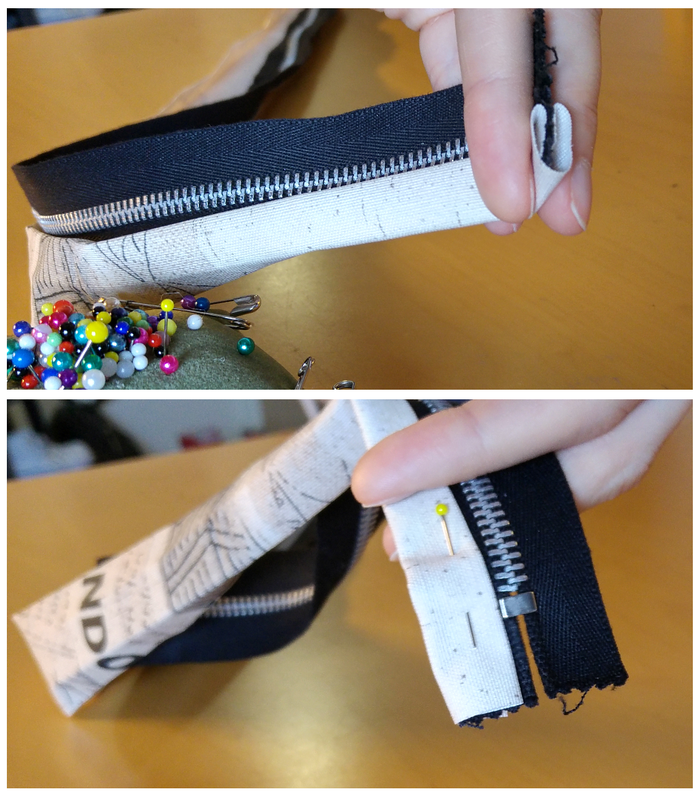 I sewed the folded fabric to the zipper. Then I just repeated the process with the other side. At this point I sewed the darts at the bottom edge of the four main pieces. Next I got to making the pockets. I started with the big one that would be on the inside of the bag. I measured the zipper and on the wrong side of the pocket piece I drew a box that was slightly longer than the zipper and about 1cm wide. 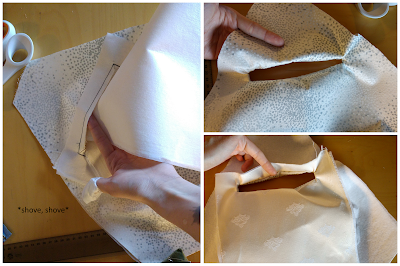 I left about 2cm above the box for seam allowance. I eyeballed the center line and the "arrows" in the corners. 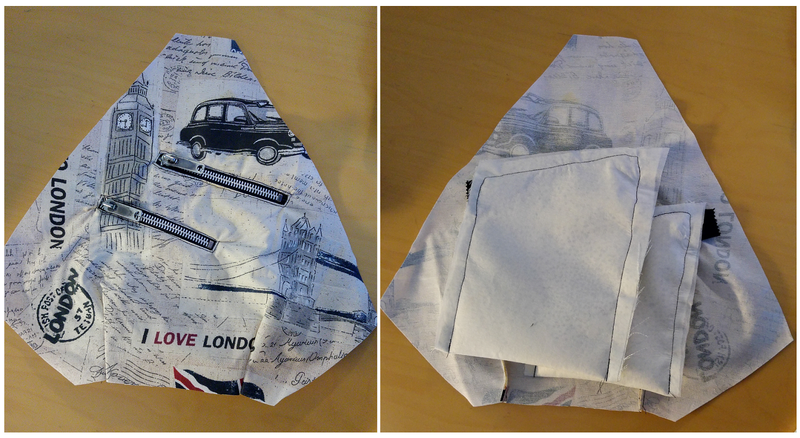 I pinned the pocket piece to the lining piece, right sides together. 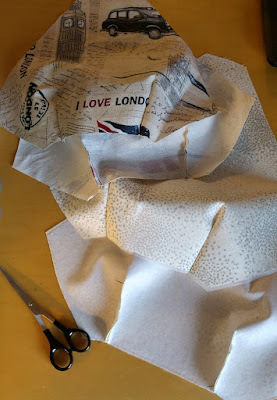 I sewed around the edges of the box. 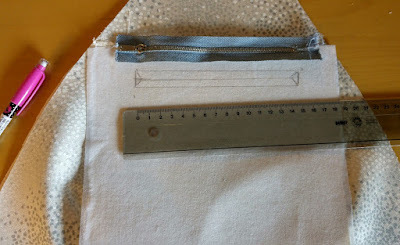 Then I cut through both the pocket fabric and the lining along the center line and into the corners. Through the hole I then stuffed the entire pocket piece onto the wrong side of the lining fabric. 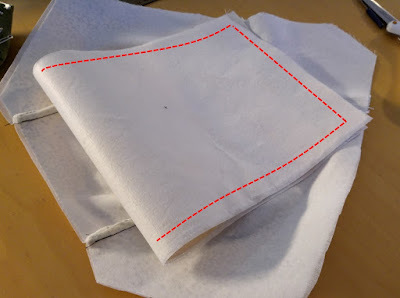 I tugged and pulled the corners in place and then ironed the whole thing so it settled neatly. I placed the zipper on the wrong side of the fabric so it was centered in the rectangle hole. I put pins on the right side. I attached the zipper by sewing along the edges of the box on the right side of the fabric. 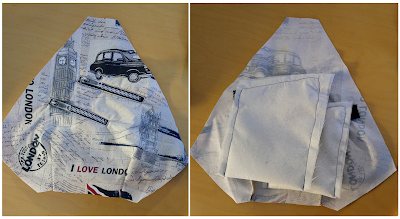 Then on the backside, I folded the pocket piece in half, creating the pocket bag. 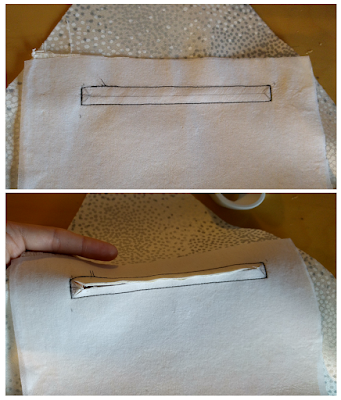 Sew ONLY the pocket edges together, fold the lining fabric out of the way or else the outline of your pocket is sewn into the lining as well! 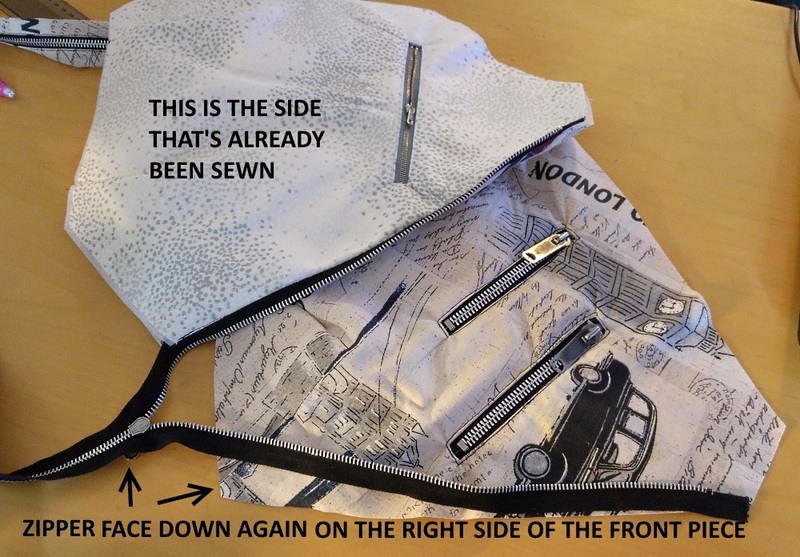 It might be a bit difficult around the zipper ends if they are very close to the edge of the pocket bag, but just make sure you're not sewing into the lining. And then the pocket is done! 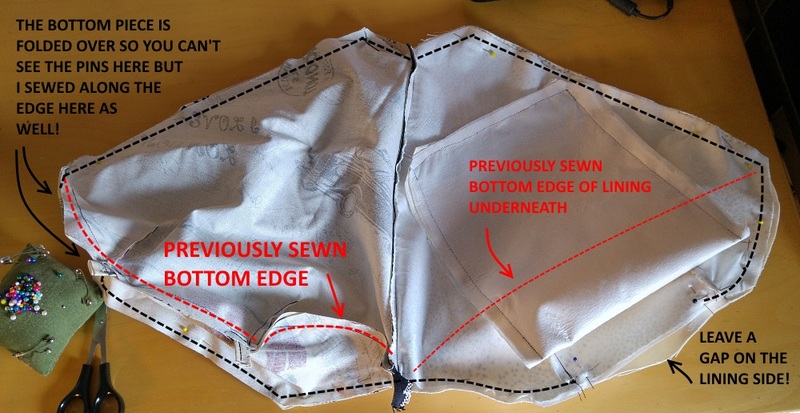 I repeated the process twice on the front piece with the diagonal zippers. Sewing two pockets like this is just as easy as sewing one, you just need to remember to keep the pocket pieces out of each others' way so you don't accidentally sew the pocket bags together! So all the individual pieces now ready, it was assembly time! I took the outside back piece (the London print one with no pockets sewn in) and the lining back piece (the one with the bigger pocket), plus the one zipper still left (mine is super long but I cut it shorter after sewing it in the seam). I placed the zipper on the right side of the oilcloth piece, with the zipper facing down. 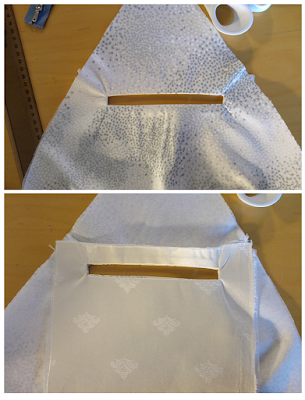 I then placed the lining fabric right side down on top of that. So then you have your outer fabric right side up, zipper face down and teeth facing in so the zipper edge goes along the raw edge of the fabric, and the lining on top of all that right side down. Sew along the edge so you catch both layers of fabric and the zipper in between. I then flipped the lining under and top-stitched along the edge to make the seam lay flat beside the zipper. 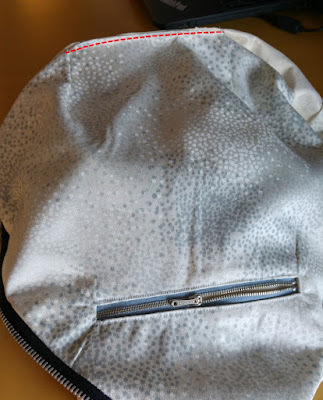 I opened the zipper and did the same thing for the remaining two pieces: zipper face down & teeth in on the right side of the oilcloth, then lining on top of those right side down. Sew along the red dotted lines. 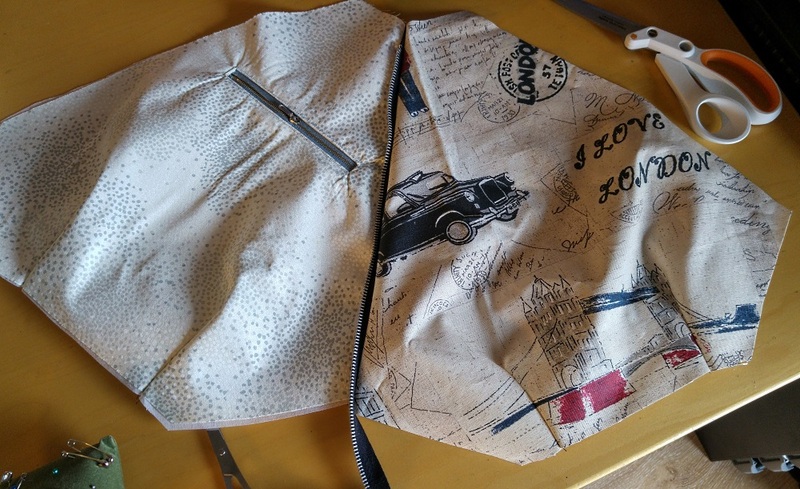 I sewed the oilcloth bottom onto the back piece on one side. 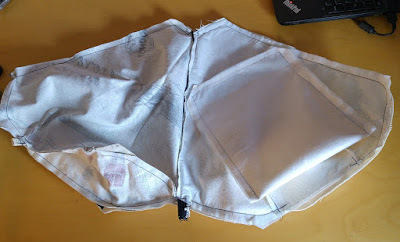 Similarly I attached the lining bottom on one side of the lining only. The other side of the bottom piece will be attached when the bag is assembled next. Okay, so next comes the confusing flipping part. 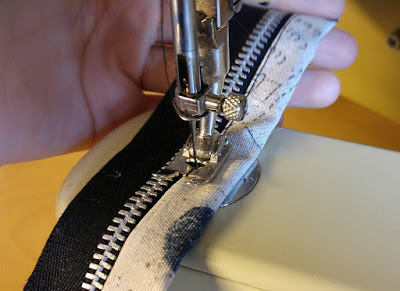 Open the zipper before doing this! Otherwise you won't be able to turn the bag right way round once the seams are sewn! 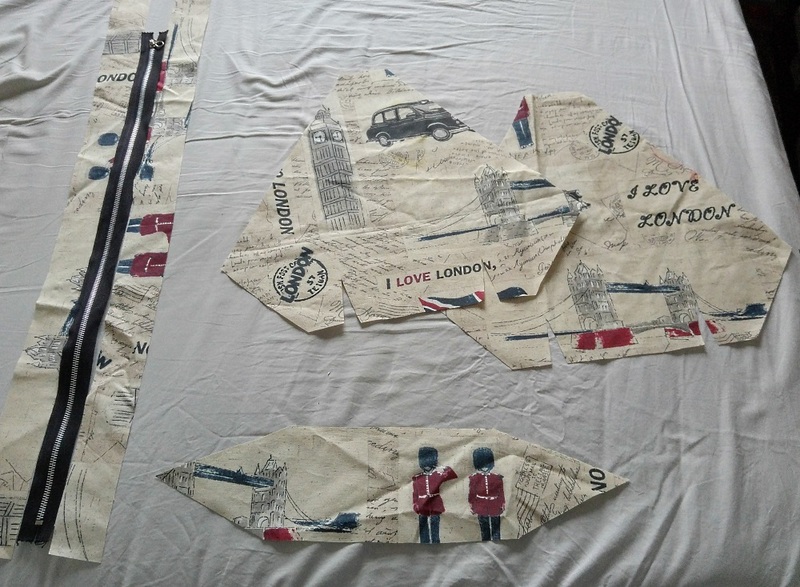 I flipped the left-hand oilcloth piece to the right so it was right sides together with the other oilcloth piece. From underneath the bottom oilcloth piece, I then flipped the lining onto the left so it was underneath the left-hand lining piece. 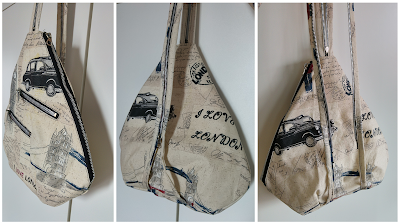 So then I had this entanglement with the lining pieces on the left, right sides together, and the oilcloth pieces on the right, right sides together. 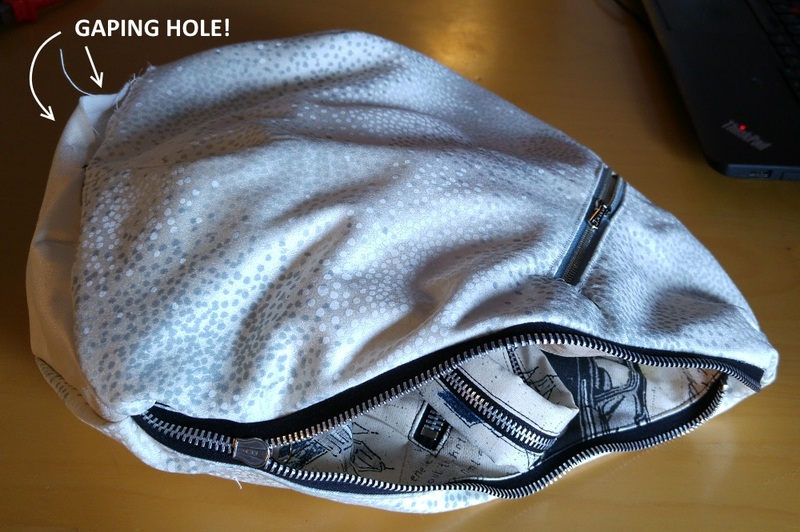 And a zipper that was open (but it's not visible in the picture because it's sandwiched between the layers). 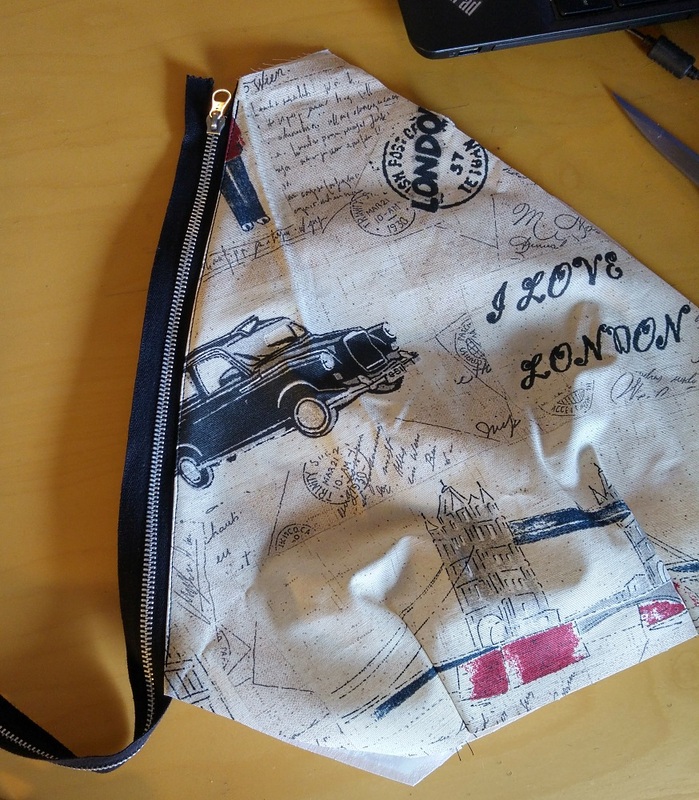 So then I sewed along the edge around the entire weird contraption, leaving a gap of about ~10cm in the bottom of the lining side. This is so the bag can be turned inside out. Around the zipper, fold all seams towards the main fabric (in my case the oilcloth), it helps the lining to stay inside the bag and makes for a neater finish. All done and ready to be turned around! 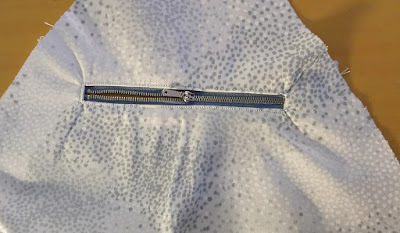 This is where you realize why the zipper needs to be open. Otherwise you'd never be able to turn the bag the right way round. 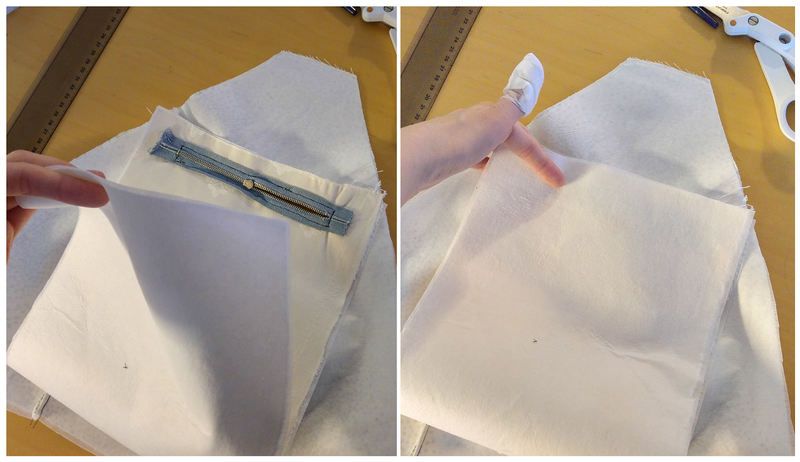 But before doing that, I needed to deal with the gap in the lining. So I folded the raw edges in and top-stitched close to the edge. Now if you want to be pedantic you can hand-sew the gap closed using a hidden stitch. And normally I might have done so, but right now hand-sewing is kind of a no-no seeing as my left thumb is MIA (you may have noticed the gauze wrapped around my thumb in some of the photos). I cut it open while cooking about a week ago and I'm kind of missing the end of my thumb entirely... 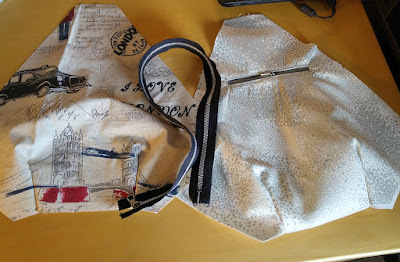 So hence, top-stitching by machine - and absolutely no hand-sewing right now, thank you very much! Then it was only a matter of pulling the outside to the outside and pushing the inside in... and that makes no sense as a sentence, but it'll be quite clear once you've gotten this far. 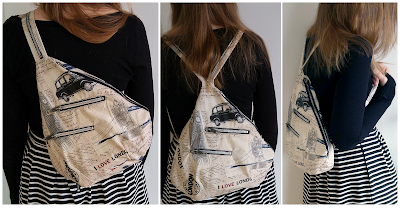 The backpack / sling bag is done! 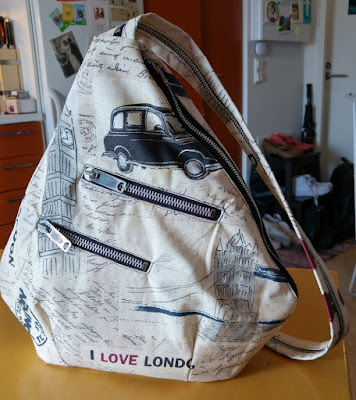 Six euros for a unique bag? That is also almost entirely made of secondhand materials? Awesome. I hope you've found this (somewhat long) tutorial helpful. 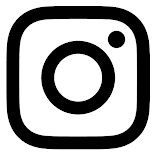 If there's anything you didn't understand or you have any questions, don't hesitate to ask in the comments! 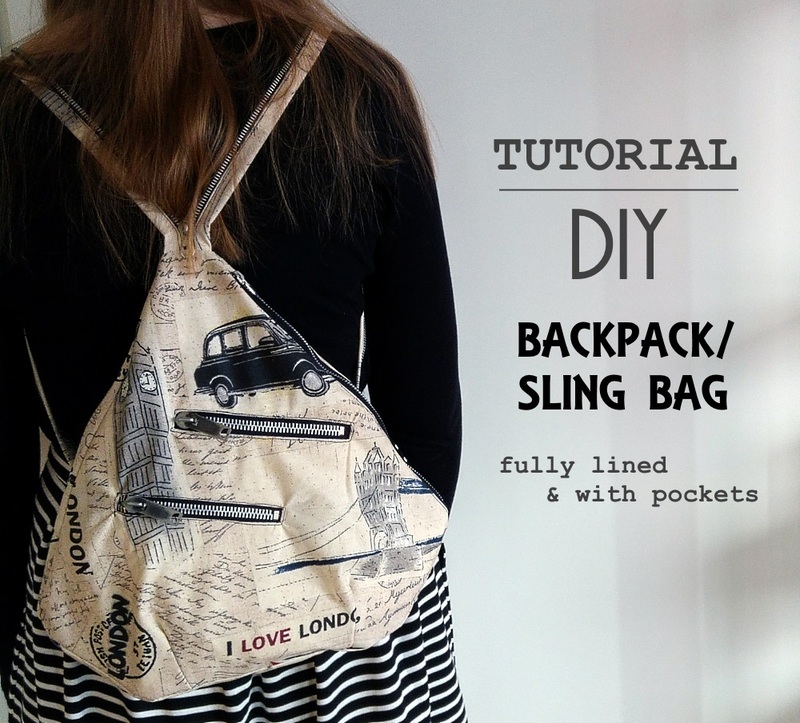 Also, if you make your own backpack using this tutorial, I'd love to see the results! 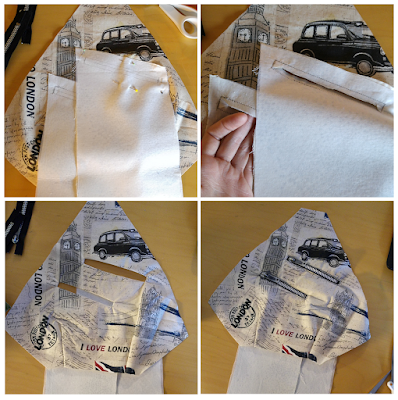 Drop me a comment, send me an email or tag your creation on instagram using the hashtag #sewscoundrel. Nicely done! I have a question about the measurements for the bottom pieces. How long would it be from point to point? I never measured it from point to point, but in the picture where the pattern pieces are depicted it says the bottom is 10cm (4") wide and the diagonal sides are 13 (~5.1"), like the front and back pieces' portion that goes upward from the bottom, and the bottom is the same 20cm (8") as the bottom of the front/back piece. 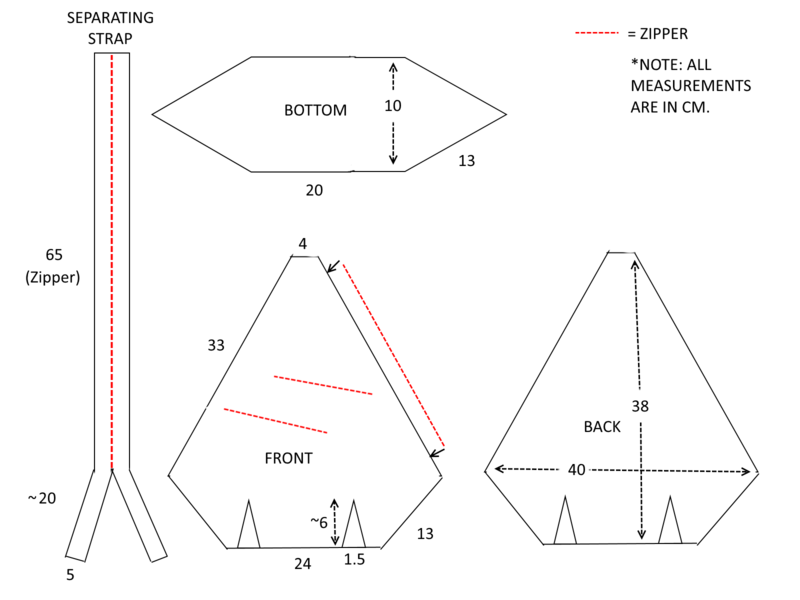 With these measurements you should be able to make a pattern piece even if you don't have the "point to point" length. 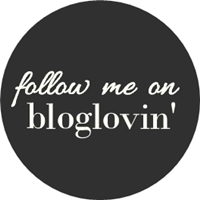 Thank you for sharing :) Very thrifty and creative! I love the style of this bag and am drawing the pattern. Having the approximate sizes of the pocket pieces would be very helpful, even as a starting point.